I enjoy Seattle in the winter time. Do not get me wrong our summers beat the rest of the world in terms of sheer awesomeness but none the less every restaurant, hotel, bar and shop in Pike Place is filled with tourists. During the winter months the market is overcast and the streets are virtually empty; Ash and I grab a bottle of wine from the upstairs market at DeLaurenti and head over to Jack’s Fish Spot from about 2pm till whenever Jack decides to close. Since we are normally in a mad dash to just buy wine we never stopped to look around…till this past weekend. Ash’s parents Mr./ Mrs. Hayes were in town this past weekend and while walking around the bustling pike place summer market we stopped in to DeLaurentis. DeLaurenti had a alot of artisan stuff from a wide range of olive oils to meats, cheese, spicies, canned goods…etc. I have literally been in DeLaurenti’s about 100x over the past 10 years and since I was always running to the top floor to buy wine I never bothered with the downstairs section (its great). Anyways…so Ash and I started talking and there was a section for fresh made pastas. 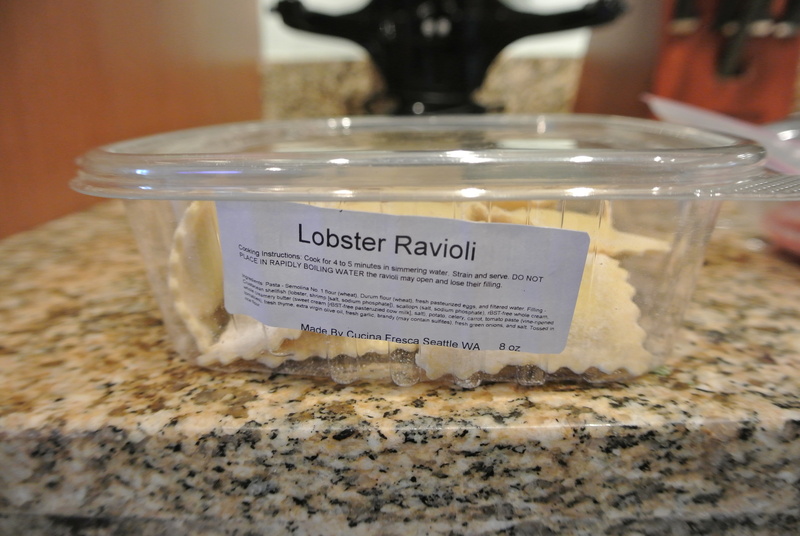 We decided to make the Lobster Ravioli. We could have probably made our own raviolis and will in a later post. 3) Add a couple dashes of olive oil. 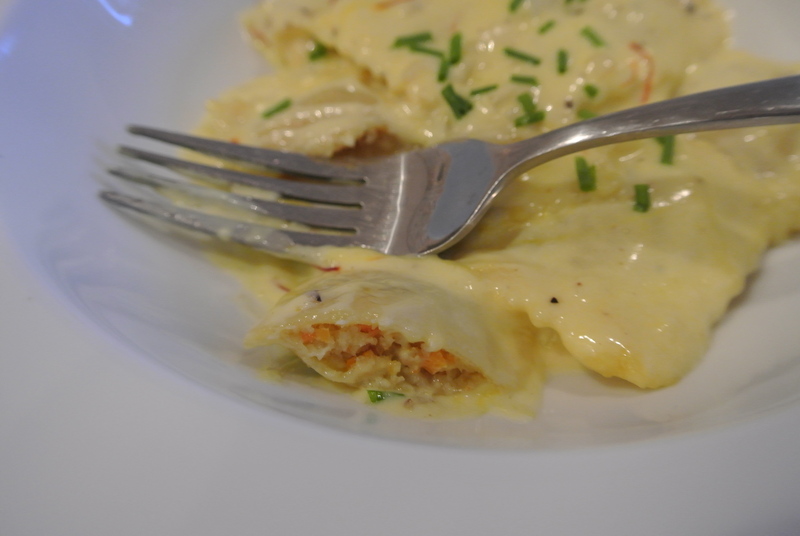 Cooked Lobster Ravioli w/ Alfredo saffron sauce. Just saw you guys on HGTV! Both of you are so funny together; you should start vlogging. Thanks Audrey. Will pick that up shortly! Thanks for stopping by. Glad you enjoyed the episode.